I may well be tempting fate as I don't even know there is one. You are probably aware of the protracted wrangling and possible safety issues with the Boeing 787 'dreamliner' which makes extensive use of Lithium Ion batteries throughout. The batteries have many benefits, high power output combined with low weight, perfect for use on a cutting edge, more fuel efficient airliner. The batteries were at the centre of investigations regarding their possible role in onboard fires, and the plane and the fleet of 50 around the world were grounded, with a successful test flight just being carried out in the past couple of days. There has long been rules governing their being carried on board. This really excellent piece on bobatkins.com gives you an insight into what in theory is, and isn't allowed on board as hand luggage, or indeed in the hold. I have been aware of that there are some restrictions about flying with Li-ion batteries but I have never, ever, been challenged by security staff at airports regarding Li-ion batteries. I fear this is all about to change, with passengers Lithium Ion batteries being singled out for special attention following the dreamliner saga. Perhaps I'm unduly concerned that I could come unstuck post dreamliner? Does anyone have any experiences of this so far? I would like to know. I have just been speaking to Alex Ray tech guru of the Flashcentre in London about this and he says that ironically following a number of Macbook battery incidents on aircraft some years ago the rules of what is, and is not safe to fly with in terms of Li-ion is actually much better defined than with other types of batteries. Flight safety should be paramount and I'm not advocating unsafe behaviour in carrying on unsafe batteries, what I'm most concerned about is an overreaction by busy, poorly informed and sometimes ignorant security staff. What can we do to ensure we don't hit trouble? Firstly, try to track down all those battery terminal covers you threw away, so when you do get stopped you can demonstrate you are being responsible. Secondly. 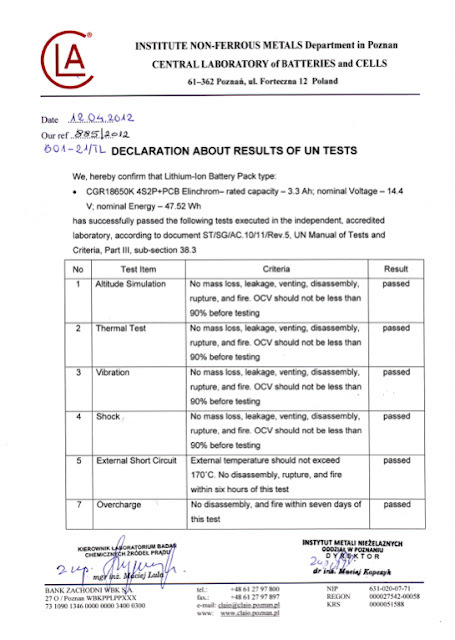 If your battery IS safe to fly with, but looks a bit iffy, track down the document of certification that says your battery is indeed safe for air transportation. I'm thinking of high-powered flash cells like Elinchrom Quadra's, I have downloaded this declaration from the Elinchrom website so you can see what it looks like. Thirdly. Know the rules! This cannot be stressed enough. If you know the rules better than the security guys do and can back this up with paperwork there is a much higher likelihood that you will make the flight. Some folk out there may think all this is overkill but better to be prepared than miss the flight or arrive with all you gear and no means to power it. Here is a page with info based on current FAA (Federal Aviation Administration) in the US. I've never had issues, and I'm in and out of the NYC airports on a semi regular basis. Then again, I don't travel with cases of gear. My AA and AAA cells are NiMH. Only the camera batteries are lithium based. When I pack my rechargeables, if I don't have a case for them I use a heavy rubberband to bind them, and then isolate the groups by using a small plastic bag for each bundle. You can't believe the number of people out there who are stupid enough to just toss things into a plastic bag, terminals facing every which way. Thank you for the airsafe link and rubber band tip, very smart. In a conversation last week it was pointed out to me that not all manufacturers go to the trouble of having a UN certification done for their products, so best check the situation out. This may seem of little consequence until you are stopped and do not have the right answers. I had all of my Elinchrom Rangers off loaded in Japan when I was flying from Thailand to Seattle, as they simply did not like the look of them and thought as they were lead acid gel that they could be dangerous. You can maybe find bigger packs if you look in the ladies hair products section of your general consumables store. If you have something like a 580 flash unit for the Canons, you can also band on a small flag or bounce card quite easily. You can just leave them on the flash all the time and they don't look all crappy like a rubber band. I stopped using rubber bands years ago. I found they broke to easily, so I started using my daughter's hair elastics instead. They work wonderfully well and are coated with fabric so they do not dry out and they last much longer. Plus I can get them in outrageous colours, which helps my aging mind track down locations of odd bits of kit (cords, batteries, or whatever I have them wrapped around). As to my story, it deals with the risks of leaving any cell (battery) in a pile with other cells (batteries). It can be quite dangerous, as they can short out on each other and start a fire. One day, while out shooting with a couple of other photographers, one of them suddenly remarked she had a pain in her leg ('remarked' is not quite right; she used a rather loud expletive). She reached into her pocket and took out the contents: a button-type cell she had along for a spare and some coins. The coins and cell were so hot she quickly tossed them into the air in they way we do when holding something quite hot. The cell had shorted out on the coins and the current was enough to make things incredibly warm! I had a few discussions with some other folks here in Oslo about batteries, so I wrote up a blog post on what I know, which is not much, but I do pass on a few tips, like using those neat little plastic cases to keep my charged cells sorted (hint: mark the case on the inside!). Good to share the shorting battery tale, they can pack quite a punch, we should all bear this in mind.